When photographers set the time in their cameras there’s a step they often miss. This topic keeps coming up again and again when helping folks on workshops, so I figured it would be worth spelling it out here. Before you update the camera’s time, take a photo of an accurate and precise clock. Then after you’ve imported the photos to Lightroom, you can use this to quickly correct the time of the earlier “wrong” photos in your catalog. You don’t have to do mental gymnastics to work out how much to shift the time. Ideally the clock you photograph will be accurate, and showing the time to the nearest second. I usually use the clock display in the GeoTagr app on my iPhone, but any accurate clock will do. 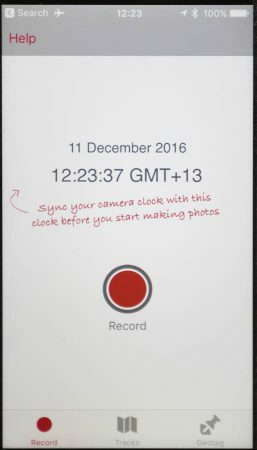 If one of your cameras has a GPS-synced clock you can take a photo of its Date/Time menu page instead. Also note that the following process assumes that all the photos you’re going to correct were taken in the same timezone as that clock. If some of the photos were taken in a different timezone (because you have been travelling or because your local Daylight Saving has changed) you may need to do an extra adjustment. In Lightroom’s Library module Grid view, select a folder (or “All Photographs”) that’s going to include all the photos you want to correct (plus extras: that doesn’t matter at this point). Use the Metadata filter (press ‘\’ if the filter bar isn’t visible) and use the filters to isolate just the photos from that specific camera. I usually set the sort order to Capture Time to make the next step easier. Find the photo you’ve just taken of the clock. Select it and extend the selection (e.g. with “shift-click”) to include all the earlier photos you want to correct by the same amount. Note that if your camera’s clock has just been drifting, the error three weeks ago won’t be as much as it is in the latest photo, so don’t go back too far. 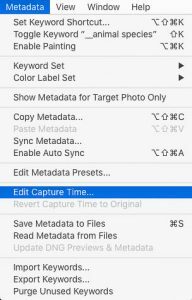 Use Metadata->Edit Capture Time to change the time of the active photo (the one showing the picture of the clock) to the exact time shown on that clock. Lightroom will work out what the correction was, and will apply the same adjustment to all the selected photos. Job done! The photos should now slot into the correct times alongside photos from any of your other cameras. But the important point is to take photos of the clock before you start anything!